The days are starting to be chillier here in West Michigan and that means it's time for Hand Warmers! I have a fun DIY party favor project for you today that is sure to keep you and your kiddos warm and toasty. Attach a favor tag to a couple warmers using twine or mini clothes pins and set them in a place where favors can be easily reached by small kiddos. These would be a prefect favor for any kind of outdoor party. Specifically I'm thinking about all the ice skating that happens here locally. 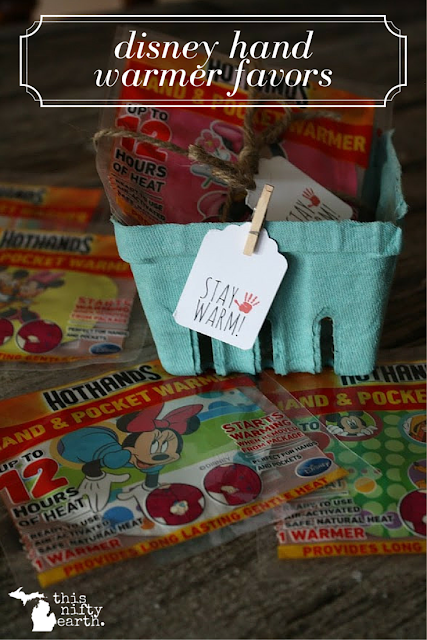 How cute is it for each child to have their own little Disney themed hand warmers? What I love about these hand warmers is that it's a safe, natural way to keep cold hands warm. Simply place a warmer in each pocket and it'll start heating up within 5 minutes! Do you have any occasions coming up that you might use these favors for? I would love to see how you use this #TNEmakes project for your own shindig!